Just when Black Milk’s album, No Poison No Paradise, hit the streets and wowed me like none other, another rapper from Detroit that goes by the name of Boldy James, he teamed up with legendary producer, The Alchemist, for an album and I didn’t even think I’d be listening to it because, for one, I had no idea who Boldy James was until about 3 weeks ago. I was told to listen to him by a couple of people, but when I heard some tracks, there was nothing that really gripped me into listening to him more, but of course, I thought about just giving him another shot with this album since I was at work and I saw that it was streaming online. It’s like whenever The Alchemist makes a project with someone, he just makes them better, and I’m not the first person to say that, because a lot of people feel the same way about it (Prodigy, Action Bronson, and most recently, Domo Genesis, to name a few). Last year, Reloaded (by Roc Marciano), was arguably one of the best rap albums of the year that got overshadowed by the obvious leader, good kid, m.A.A.d city (and you can throw in Skyzoo’s A Dream Deferred in there as well). 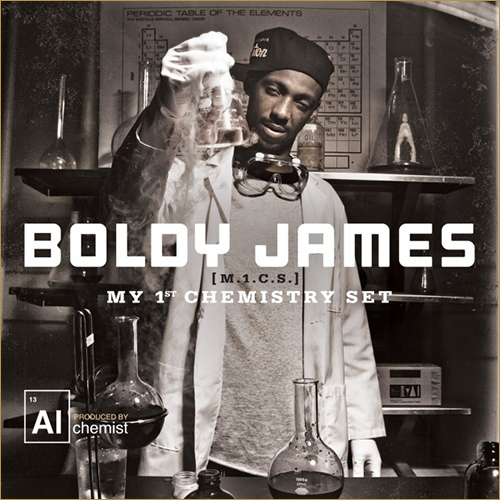 This year, I feels as though Boldy James can make the case for having one of the best projects out because the project matched with his grungy voice & flow was rap harmony at work. I haven’t watched Breaking Bad (yet), but from the fact that the series had just ended blended with the title and cover art, it’s obvious what the theme of this was going to be, so if you were a Hip Hop fan and BB fan, this was probably an ideal album for you to indulge yourself in. The album in itself was reflected upon the setting of Detroit and the drug game that comes with it. Detroit in itself is seeing some pretty miserable times, so the expression through the beats and the style of Boldy’s rap is one to take notice. Everything is rugged and you have to look at it from the perspective that it’s not all glitz and glamour when you’re on the streets trying to make a living selling illegal drugs. It’s a hood album – simple as that. It feels like the hood, it sounds like the hood, and The Alchemist comes through again by providing a great soundtrack as to what a rap album should feel like when you’re depicting that concrete feel from a particular vantage point. What I liked about Boldy was that he reminded me of Prodigy the whole way through when prodigy was really up there when you talk about who were the best rappers in the late 90s & early 2000s (although, him without Havoc wasn’t exactly awe-mazing). Boldy (with some good features from Action Bronson, Earl Sweatshirt, and Domo Genesis to name a few) was able to remain consistent from start to finish and not stray off topic by doing anything extravagant. The production is what really kept me interested all the way through, because I relatively enjoy Alchemist beats any day of the week. Much like Reloaded, this album will fly under the radar, but later on, the appreciation will come from people who slept on it the first go around; don’t be one of those people – appreciate it now.